I’m circling back around to my arty side this year. In recent years, I have taken a big break from painting and drawing. I needed a breather but now I have realised just how much I have missed my art practice. So, I got myself a moleskine art journal (my first one) and have started sketching and water colour painting in it. 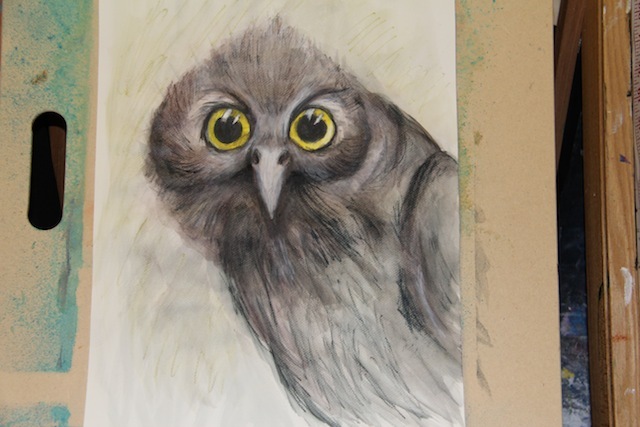 I am totally inspired by author and illustrator Kate Knappe with her cute little birds, so you will see an image that I drew to honour her artistic expression in the photos below. 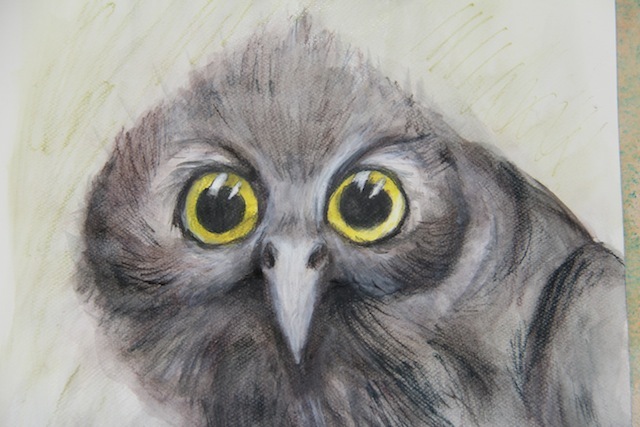 If you see her work around – there are a lot of greeting cards with her artwork in Australia – do support her if you can and if you like the art of course. I’m all for supporting living artists who can do with the dollars in their bank account so they can live life and continue to do what they love. This is a page from my new moleskin art journal with another little bird inspired by Kate Knappe. It also has an orb, inspired by a walk along the beach today. Here is one of the pages out of my moleskine art journal. I’m going through a reflective stage and wondering what I should do next? Do I keep focusing on writing my novel and slogging away attempting to get it published? Or do I study something? Something else? Should I study art? Should I study something that will help me in my day-job? I do enjoy learning but I am not sure what to do. What is next for me? So this piece of artwork is a true reflection of the questions and confusion whirling around inside of me. This page of my art journal is a reflection of how intricately interconnected we all are. At least, that’s how I see the world. I have recently decided to sponsor two young girls through World Vision and, hopefully, make a difference for them and their community. I didn’t do this lightly. I feel very strong about young girls having the opportunity for a good education and waiting until a decent age to be married. It is my hope that my sponsor children and their community will embrace this opportunity to have more choices and be lifted up and out of poverty. As I was drawing this image, I was thinking about my sponsor children and how we are worlds apart, both geographically and with regard to quality of life style and education and choices. But I believe that all beings are interconnected and there are threads that connect us. I believe that one act can have a multitude of effects. A lot of the time, I do not know the effect I have on people, but it is my hope that my effect is a positive one for all concerned. So, I’m getting back into my art. I’m thinking about things outside of my fiction stories but I am still drawn to my writing. I love it. I’m just not keen on editing. I’m not averse to hard work. I just think I’m a bit creatively burned out at the moment. But despite my burn out, I am still returning to The Living Death of Toddy James and day by day I am making editing progress. I’m up to chapter six so far. It’s a matter of small daily habits that add up to big changes. I won’t give up. I’ll rest and I’ll refocus, and I will edit my novel. It takes grit and determination to get these things done. Now, as promised, here are some more photos of my awesome UK holiday from last year. In the above collage, Dave and I went to Edinburgh and saw the city, Edinburgh Castle. We also visited a fabulous historic place called Torphichen Inn for dinner and a show. Wow, what an amazing place. I was in love with the atmosphere, the friendly welcome and the life size cardboard cut out of Jamie Fraser from the Outlander series, written by Diana Gabaldon. The ladies at our table were a little shocked at how excited I was to see the cardboard cut out, but I had only just finished listening to the audio book and watching the series, so in my mind, Jamie Fraser had come to life! I still love David, but it was Jamie Fraser! I think David was in love with Torphichen. I think he wanted to immigrate and live there for the rest of his life. It was green and homey. The Torphichen Inn was filled with friendly people and the services was excellent. We had haggis. I actually ate some and David had a bowl-full. The photo above is the Torphichen Inn. The show had bag pipes, singing and excellent hospitality. I truly loved Torphichen and felt very warmly welcomed. We saw the Kelpies sculptures several times as the bus took us from the hotel to Edinburgh and back on our visit. They were spectacular and it was the first time I’d heard that Kelpies were shape-shifting water spirits that take people and drown them. As an Australian, when I hear the word ‘kelpie’ I think of a type of dog, so this revelation was endlessly entertaining to all of the Aussies on the bus. Dave and I also visited the cafe where J.K. Rowling wrote the first Harry Potter book – OMG, I almost wet myself with excitement. It’s called The Elephant House. We had coffee and cake and then we entered the toilets which were completely covered in Harry Potter fan scribblings. It was surreal. I didn’t like the way people wrote all over the toilets. It was oppressive. I think being a fan is great, but defacing property falls outside of my boundaries for appropriate ways to show adoration. Anyway, of course, I had to buy a mug to remind me of this special opportunity to dine in cafe where one of the most famous writers of today did her plotting, characterisation and writing. I was hoping some of her inspiration and determination to finish writing would rub off on me. I’m still hopeful. In the photos above, you can see us at The Elephant House. We also visited Greyfriars Bobby where this little loyal dog is honoured and remembered. This church was fabulous, but for those who enjoy a bit of ghost hunting and paranormal thrills, I have to say there was a crypt there that gave me the shivers. It’s the circular one with the dome roof. It had two doors with square windows made of wrought iron. I was too scared to get too close to this one. I kept getting the shivery sense that something was inside watching me. My writer’s imagination went wild, wild, wild with exciting ideas for creating paranormal wonder in my stories from this experience! Okay, for my last Scottish highlight, here’s a super short video where Dave and I went hunting for the Loch Ness Monster and caught a glimpse! Happy creativity whether you write, dance, make art or create music. Whatever you do, I hope it brings you joy and happiness. Well … I said I’d do it and I’ve done it. 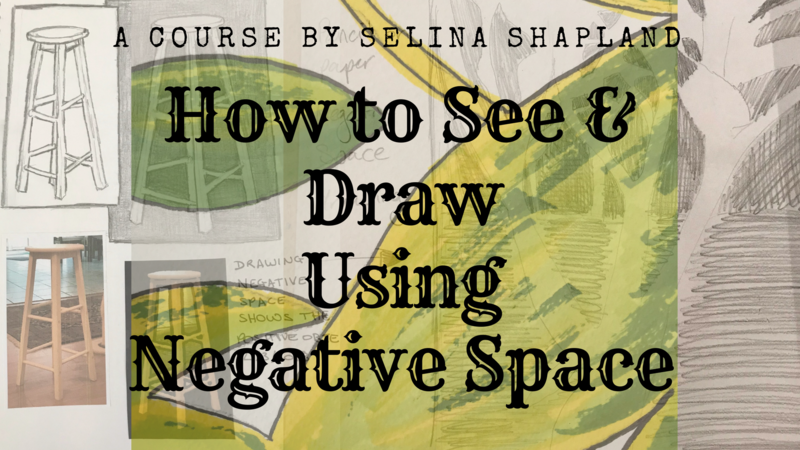 After a month of learning and multiple attempts at shooting video, I have finally created a short Skillshare art class called, How to See & Draw using Negative Space. It was quite a challenge to work out how to break down the steps of how I see and draw negative space around an object, but I did it in the end and I wanted to share this with you. If you’re interested in checking it out, please click this link. I think I am very much looking forward to the Christmas / New Year break to allow myself to chill out and regroup for 2014. So, as I do when I have to process things inside me, I have turned to my art as a way of expressing things that I cannot verbally say. 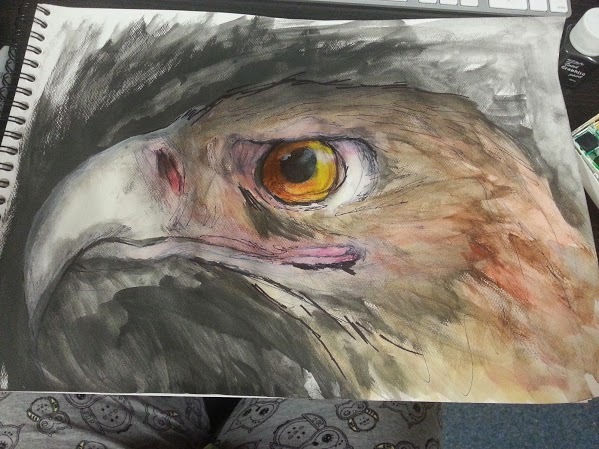 This image above shows a sketchy kind of painting of an Eagle the my partner works with here in Australia. I loved the photo of this bird and felt inspired to use his side profile as my muse to let out some of the ‘stuff’ inside me. I couldn’t tell you what I was thinking about as I do not know. I was just being while I played with pen, graphite paint and watercolours in one of my visual diaries. It turned out pretty okay so I thought I’d share it. Oh and the grey thing at the bottom of the photo with the owls all over them are my legs in my PJ’s. Yes… I paint in my PJ’s. I haven’t been doing much art lately, but I can feel the urge and the inspiration kicking back in. I am grateful when this happens and I feel inspired in my arty life again. So who knows what the holidays will inspire me to create. I am going through a jewellery phase, a creative writing phase and now it seems my drawing and painting phase is coming back online – woot! 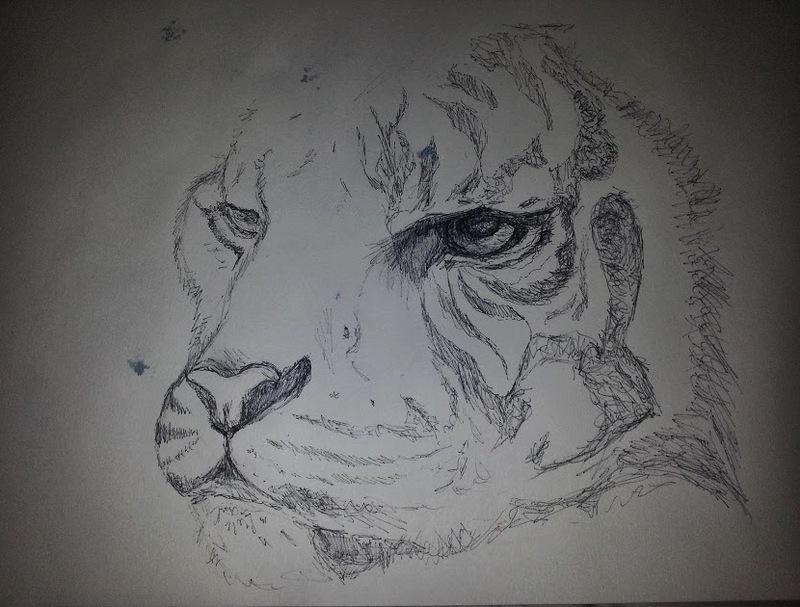 Last night, before bed, I got out my A3 Visual Diary and black ink pen to continue to develop this Tiger drawing. I am liking him more and more each time I touch pen to paper. I think I may need to invest in a new black ink water soluble pen soon. This one is starting to die on me. I think I have punished it a bit in recent months with some of my other artwork. I really do love seeing a piece of artwork come together. 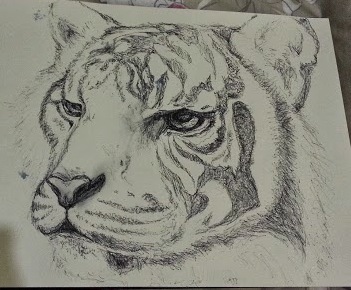 This tiger inspired me as he is so relaxed and intent on watching something of interest. I really like it when I float into that subtle alert but relaxed state of being myself and this tiger certainly embodies that to me. More photos of the progress to come. This is a tiger in the making. 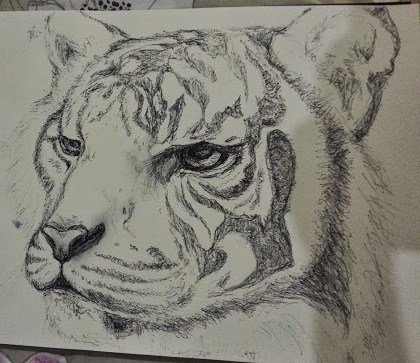 I thought I would put up a progress image as I draw this tiger. I think I might put up several progress shots as he develops. This is completely drawn free hand by me. 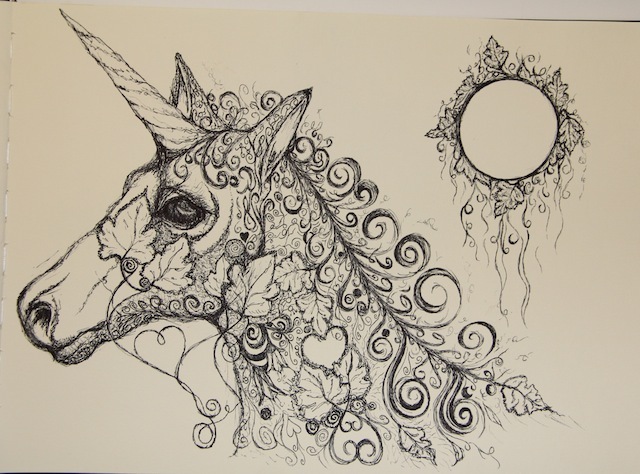 I love drawing, painting and incorporating animals and nature in my artwork. It’s been a while since I have really immersed myself in some artwork as I have been focusing on getting some other businesses up and running and fundraising. But tonight I realised that it was time for me to recharge my emotional and spiritual batteries… so I took my black pen and little newsprint pad of paper upstairs, sat on the couch and while the TV was burbling in the background, I began to sketch. 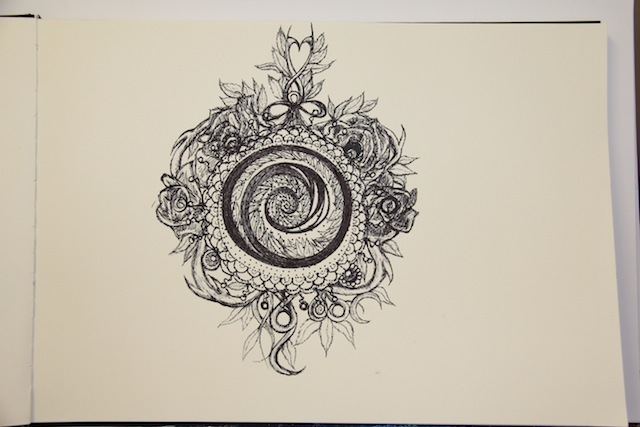 I had no particular type of drawing in my mind at the time of putting pen to paper. 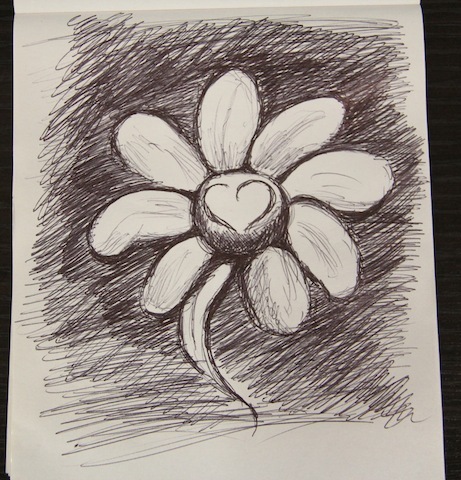 I just started by creating a heart that morphed into a circle, a leaf and a flower. Before I knew it, the drawing you see above burst off the page to reflect back at me some of the changes I have been making inside myself lately. This drawing represents the personal and professional growth I have been going through. Symbolically this drawing represents the transition from feeling so confused about life, feeling directionless, fumbling around in the darkness to planting a seed of hope in the dirt and allowing life to begin to sprout through careful nurturing. I feel like my life is starting to bloom in many ways, in ways that I have always dreamed would happen and never truly thought would happen. My heart desires more… fulfilment in life and connection with the things that truly matter to me. I no longer want to be everything to everyone else, always trying to please others, living up to other people’s unspoken expectations and failing fantastically. It’s too much pressure and I feel that my soul is calling me to embrace the silent simplicity that nature inspires. I do not know where this will take me, yet, I feel like I have stepped into a phase of my life where I am beginning to slew away the rubbish and externally imposed yet too well internalised shackles that have bound me throughout my life. I am tired of being a people pleaser and yet, I want to be a good person, loving and kind. However, I am sure that I can be all those things without losing my soul to slavery of external expectations. Please feel free to comment and let me know if you go through any of these things too.